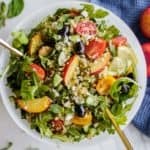 A summer Greek Quinoa Salad loaded with nectarines, fresh mint and basil, and and all the greek salad regulars – tomatoes, cucumbers, and olives. This quinoa arugula salad with feta is the perfect light summer meal or bbq side dish. I adore this time of year when soups are put on the back burner, and it’s time to serve salads galore. 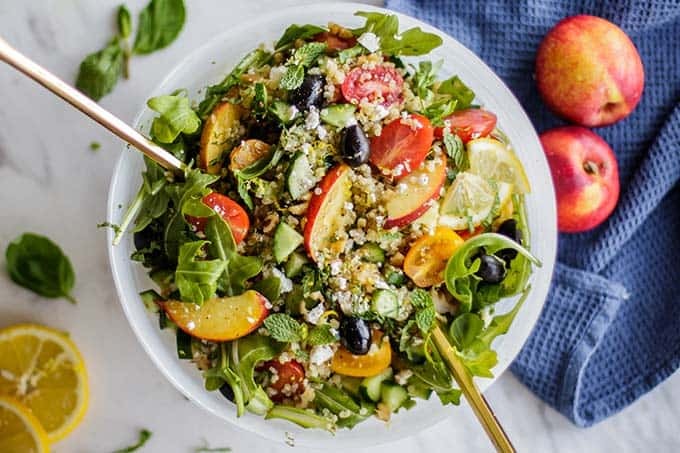 I eat salads nearly every day for lunch and dinner — to lighten up my meals, I usually start building my meals with a bed of spinach or arugula. When I am making lunch, I love to add some roasted veggies along with some fresh veggies, and then top it with walnuts or an egg, or sometimes some leftover chicken or fish from dinner. Occasionally we all need a fancy salad though, and here is the perfect one to start with. While dreaming up how to dress up this quinoa salad, I knew I wanted it packed with fresh summer flavors. We love greek salads, so that was a start. Then to make it extra special, I decided to add one of my favorite summer fruits — nectarines. 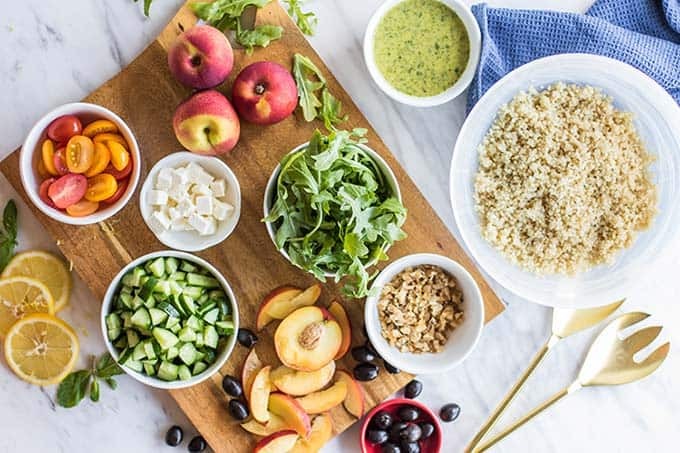 Buying fresh, sweet nectarines is the key to making this salad! And honestly, you aren’t going to want to miss this bright green summery dressing. Whisk together some olive oil, red wine vinegar, salt and pepper, minced garlic, and lemon juice, and then I take chopped mint and basil, and whisk together all the ingredients. You can also throw it in the blender and give it a whir, which will yield a beautiful bright green dressing. This salad is easy to make. Once your quinoa is cooked, it only takes about 15 minutes to add the rest of the ingredients. Don’t skip the nectarines. Look for ripe nectarines that will easily pull from the pit, so they slice nicely. 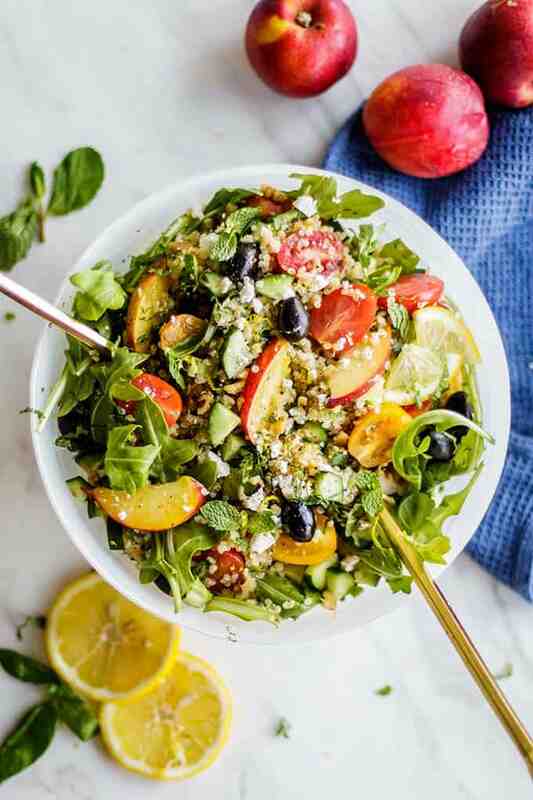 The sweetness adds so much complexity to this summery greek quinoa salad! The rest of the usual ingredients can be chopped however you’d like — cherry tomatoes, cucumber, and olives. Use kalamata olives if you like. I prefer small Spanish black olives. After the quinoa is cooked, fluff with a fork, and then allow to cool. In a large bowl, add the quinoa, and toss with arugula. I then add the rest of the ingredients on top, and mix in a bit. Drizzle on the bright summery vinaigrette, and then garnish with feta cheese, walnuts, and more mint and basil. Make it Vegetarian/Vegan: This salad is easily made vegan by swapping the honey in the dressing for date syrup, and omitting the feta cheese. Make it Paleo/Whole30: Omit the quinoa, and use a chilled cauliflower rice in it’s place. Use extra walnuts and omit the feta cheese on top. The dressing can be made Whole30 compliant by simply omitting the honey, or using a medjool date in it’s place (blend well prior to adding the herbs to the dressing). Increase the Protein: Grilled chicken or salmon would be amazing served on top of this salad. 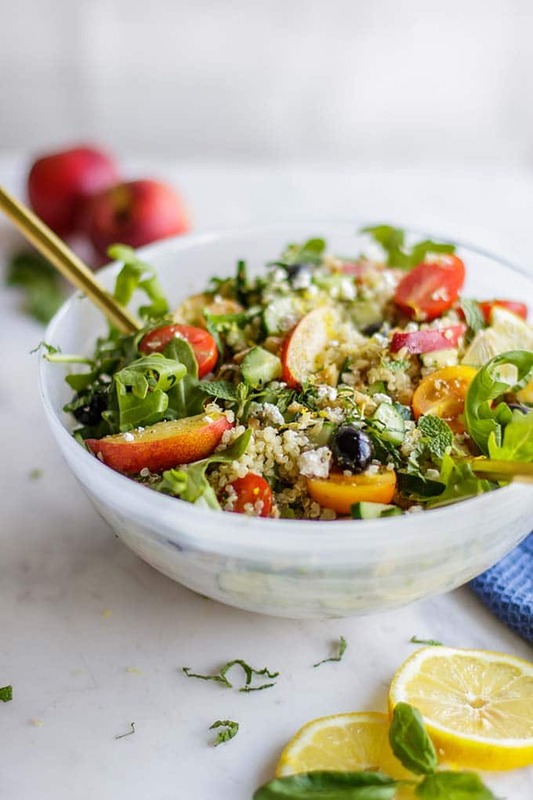 A bright and summery Greek quinoa salad with arugula, nectarines, and mint. This summer quinoa salad is a delicious light meal on it's own, or the perfect compliment to any BBQ. Add quinoa and 2 cups of water to a pot over medium high heat. Bring water to a boil. Cover pot, and reduce heat to low. Allow to steam for about 15 minutes while preparing the other ingredients. Chop cucumbers, nectarines, tomatoes, and walnuts. Prepare the dressing by adding all the ingredients to a blender, and processing until it's a vibrant bright green. Once the quinoa is cooked, fluff with a fork, and set aside to cool. In a large bowl, add quinoa and arugula, and toss to combine. Top with cucumbers, tomatoes, nectarines, and olives. Gently mix in. Drizzle dressing over the salad when ready to serve, and garnish with additional herbs, walnuts, and feta cheese. If not serving this salad right away, don't add arugula. Mix the quinoa, cucumber, tomatoes, olive and nectarine with the dressing, and refrigerate. When ready to serve, stir in arugula, and top with walnuts and feta cheese. This was so so yummy. I was I intrigued by the nectarines. The basil and mint in the dressing puts the salad over the top. Thank you for sharing. I'm so glad you loved this salad! One of my favorite dishes this summer -- the nectarines and mint add the best summery vibe!